We look ahead to the Premier League clash between Manchester City and Wolves from the Etihad stadium. The champions will head into this match full of confidence, after three straight victories, including a vital win over title rivals Liverpool, as well as two cup drubbings of lower league sides. 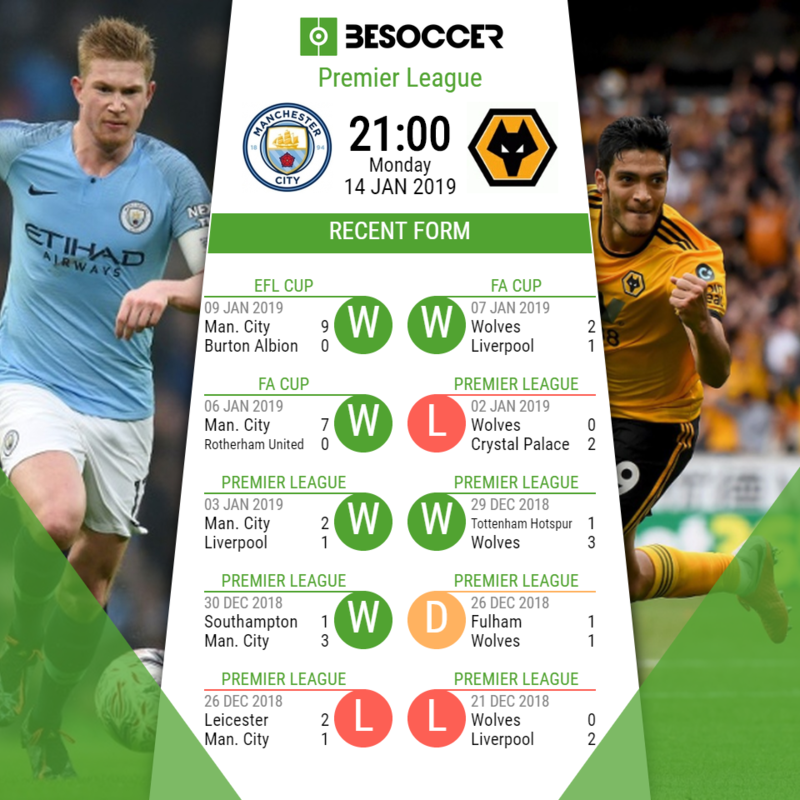 However, in spite of his side's good form, manager Pep Guardiola will be wary of the threat posed by opponents Wolves, who already held City to a score draw at Molineux earlier on this campaign. Nevertheless, after enjoying a marvellous resurgence from their winter-blip, City will be aiming to cut the gap at the top of the table back to four points with a win at home. In terms of absentees for this clash, the hosts will have to make do without full back Benjamin Mendy, who is still making his way back to fitness after a lengthy knee injury. Likewise, keeper Claudio Bravo is still out for the season, although he was unlikely to be named in the side anyway. Skipper Vincent Kompany and Sergio Aguero should both be fit to feature, having been rested for the two cup ties this past week. Likewise, war horse Fernandinho and playmaker Kevin De Bruyne will also return to the side. Visitors Wolves will have high hopes ahead of this next away trip to one of the 'Big Six', having won convincingly at Wembley against title challengers, Tottenham, last week. Manager Nuno Espirito Santo has often called for his side to become more consistent in their league form, and what better way to do this then to pick up another victory away from home? Last year's second tier champions have taken to the top flight like a duck to water, and whatever the result, Monday's match is sure to be an exhibition of great passing play from both sides. Regarding team news for this clash, Wolves have no fresh injury concerns, and as such, boss Nuno will have a full compliment of stars to choose from at the Etihad Stadium. "The big clubs don't buy players for six months. If you don’t have injuries and you are satisfied with the squad, it’s going well, we will play with the players we started the season with." "(Wolves are) strong, physical, good at set pieces, strong on the counter attack. When you are tired in the last minutes, they put on new players. They defend deep, switch play, and control many areas." "Our approach is simple, we do our homework and when things happen we announce them, until then it’s just rumours. The transfer window is open, for us to bring in someone, we must really think they can add something new to our squad. We are happy with our squad, so it’s not easy to reinforce." "The next one is always the most important, but City is going to be tough, we have no doubts about it. They’re a fantastic team, with a fantastic manager and fantastic players, the way they play. We have to prepare ourselves for it." City have won five of their last six top flight home meetings with Wolves. City have failed to keep a clean sheet in any of their last six Premier League home games, which is their longest run without one since 2015. Wolves have nine points from their seven games against the so-called 'Big Six' so far this campaign, more than any other team outside of the top six. Manchester City: Ederson; Walker, Stones, Laporte, Zinchenko, Fernandinho, De Bruyne, Silva, Sterling, Bernardo Silva, Aguero.